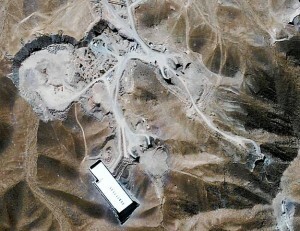 Satellite image of Iran’s Fordow nuclear enrichment facility. The International Atomic Energy Agency on Friday warned that the Iranian government continues to make progress in its effort to boost uranium production and refinement in the country. It noted that Iran has, in the past three months, completed installing new centrifuges in a secret nuclear facility and has refused to provide the IAEA with opportunity to monitor its activities. The IAEA also believes that Iran is trying to destroy evidence of previous nuclear enrichment activities ahead of scheduled IAEA inspections. International efforts to monitor and prevent Iran from developing nuclear weapons materials have to-date focused on several resolutions of the UN Security Council, and on international negations between the United States, China, Russia, France, the United Kingdom, and Germany (the so-called P5+1 group) and Iran. Against the international backdrop, the Israeli government continues to threaten unilateral action against Iran to prevent it from developing a nuclear weapon, raising the stakes for all parties involved. The primary challenge, though, is that there appear to be few good options in dealing with Iran. Economic sanctions are already in place and are having a devastating effect on the Iranian economy. There was a glimmer that the sanctions may force the Iranian government back to the negotiating table, but it is not clear whether or not that would happen before Iran developed a nuclear capacity, fundamentally altering the nature of international negotiations. Covert efforts, including the deployment of computer viruses targeting Iranian nuclear facilities, have appeared to slowed Iran’s progress but have not stopped it altogether. And a military strike against Iran could create broader challenges in the region, undermining support for US efforts in Pakistan and Afghanistan, and creating uncertainty in global oil markets, threatening the global economic recovery. What do you think? What is the best option to deal with Iran’s nuclear ambitions? Should the United States continue to support international efforts at a negotiated settlement? Should it support Israeli proposals for a military strike despite the economic threat posed by such an option? Take the poll below or leave a comment and let us know your thoughts. This entry was posted in Uncategorized and tagged Iran, Israel, nuclear proliferation, nuclear weapons, United States. Bookmark the permalink.